Posted on March 19, 2013 by The Flat Girl	in Journal and tagged 7 Deadly Zins, 7 Heavenly Chards, Aeneis, Ambiente, art, artists, Claude Monet, Fabian Perez, Fanch Ledan, Interior with Klimt, Interior with Max, Lover's Moon, Michael Goddard, Painter, paintings, The Kiss, Thomas Rut, Untitled II, Vincent Van Gogh, Visual arts, Waiting for the Romance to Come Back. I have always been a fan of art, the thought of somebody using their creative talents to share their thoughts and ideas with the world. Songs, paintings, sculptures, literature, any expression of how somebody is feeling inside – it all strikes me in different ways, depending on how I am feeling at the time. Being somewhat dark myself, I am typically drawn to darker images myself, and the darker the personal story of the artist, I am usually more drawn to him. For example the story of Vincent Van Gogh makes me like his art even more. However, I have tried to expand my range to include more whimsical and colorful pieces; whether I own them or just covet them. Michael Goddard – his pieces appeal to my whimsical side, which does not come out very often. While I do not own any of his pieces yet, I almost did, but changed my mind at the last minute. I determined I was not “fun” enough to have anything of his in my home. If I did, I would start with “Lover’s Moon”. He uses incredibly vibrant colors and most of his other art is fun and whimsical. 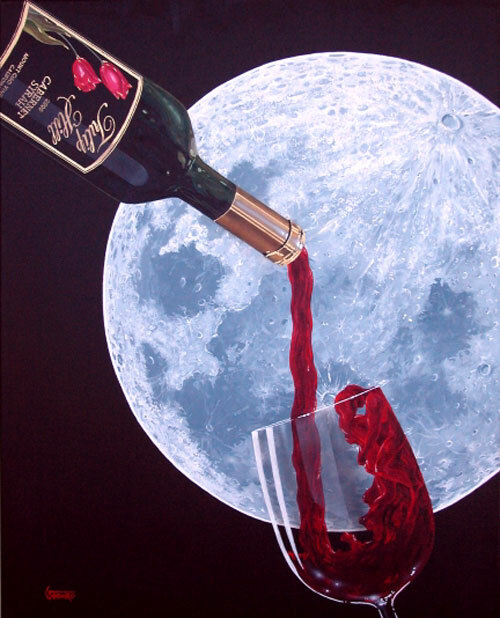 Michael Goddard – “Lover’s Moon” Note how the wine turns into two lover’s silhouetted against the backdrop of the moon. 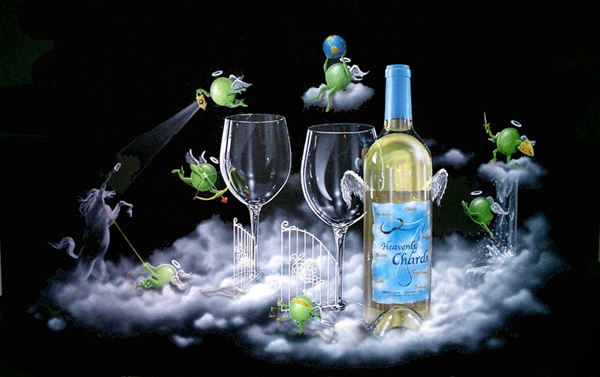 Michael Goddard – “7 Heavenly Chards” As I do not drink Chardonnay anymore (it gives me migraines) I thought I could not own this piece. I realize this was a serious decision for a fun piece. 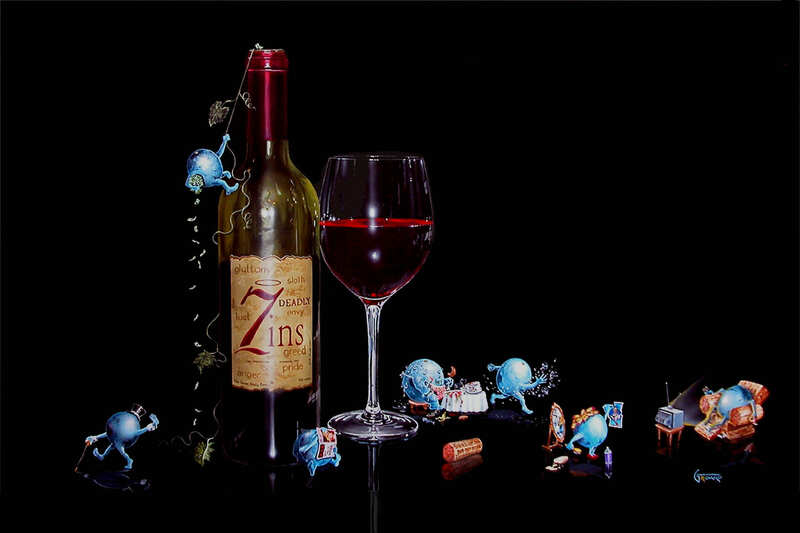 Michael Goddard – “7 Deadly Zins” I do not drink reds… same line of thinking as the Chardonnay. I take myself far too seriously. 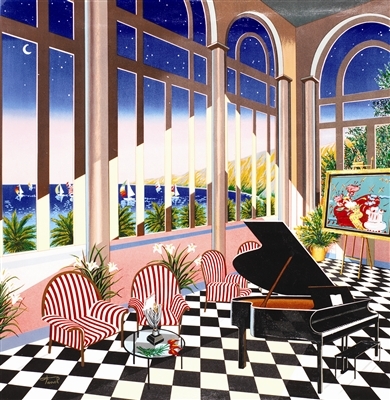 Fanch Ledan – Ledan is a French artist known for his bright colors and his “interiors”. Fanch Ledan – “Interior with Max” This is one of the first paintings we bought. If you read my posts last week, there is a picture of it hanging in my apartment. I love the bright colors, the ocean outside, and the miniature of the Peter Max, since we also own a Max (not the one pictured, though). 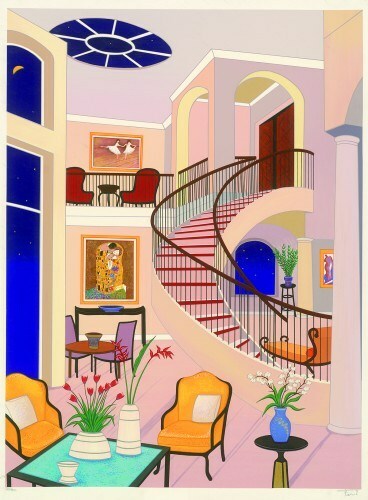 Fanch Ledan – “Interior with Klimt” – Another interior, as is Ledan’s signature. Klimt’s “The Kiss” can be seen to the left of the spiral staircase. I am fond of this picture as we used to live in a house with a spiral staircase. It was a nightmare; you never think about what it will be like to move the furniture upstairs. Thomas Rut – Rut paints mostly semi-nudes; they are very athletic, as his father was an Olympian if I am remembering correctly. Thomas Rut – “Ambiente” – We have this painting, although it is in storage; my apartment is the size of a hotel room, so there is not enough room for all of the art. Thomas Rut – “Aeneis” – This is the other painting hanging in my apartment. We bought it because I also have long dark hair and similar features. 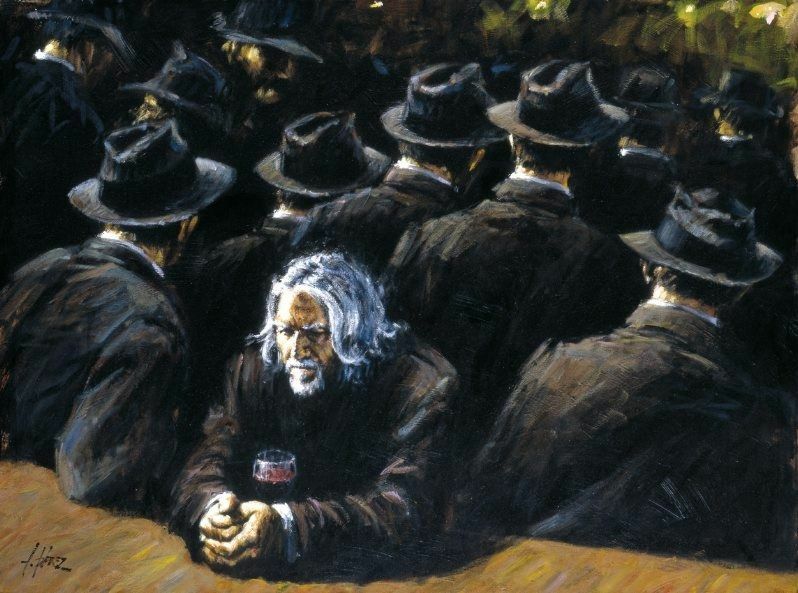 Fabian Perez – Perez is by far my favorite artist currently; while I do not own any of his pieces, I truly want several. 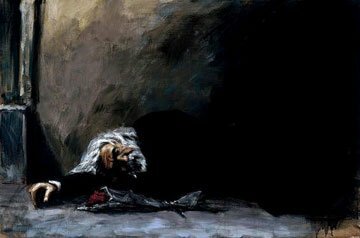 Perez often paints dark scenes in bars and brothels; he grew up the son of a prostitute in Buenos Aires. These are just two of my favorites. 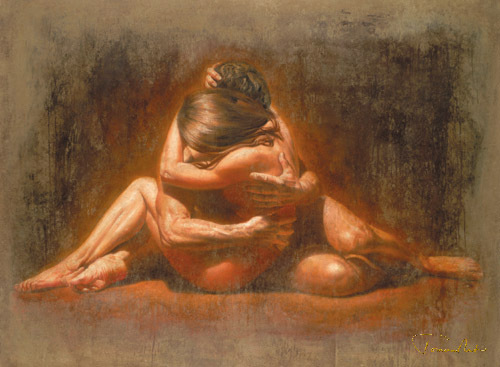 Fabian Perez – “Waiting for the Romance to Come Back II” My all time favorite painting. There are other artists I enjoy: Romero Britto, Peter Max, Van Gogh, Monet, oh… there are so many. Perhaps I will have to have a second edition of the artists I enjoy. I love walking the halls of art museums, it makes me want to create something new, or just get lost in imagination. What a wonderful way to spend an afternoon. I guess I’ve been a lifelong admirer of David Hockney. An Englishman who went to California. His images of naked youths in swimming pools stood the art world on its head. Now he’s back in the UK and feted as Britain’s No. 1 Painter. A true artist in every sense of the world. There are so many wonderful artists, it is impossible to know them all. Oh, I meant to add. I’ve sold at least 50 more paintings than van Gogh. Well of course, he never sold any in his lifetime. He did give one to his brother in exchange for a loan, but that was it. That last picture with the lone guy facing one way and everyone else facing in the other direction, that really speaks to me as if that is who I was meant to be. It speaks worlds to me. I don’t need validation and I very specifically don’t want to be part of the herd. I’m so validated I’ve got a stamp on my arse. Thank you. I enjoyed sharing.